According to a 2018 review published in the Journal of the Medical Library Association, “clinical information” is the top category discussed in current literature regarding how the health information professional role is emerging and evolving. But while it’s commonly known that the role of clinical informationist (CI) is in high demand, what does it really entail? 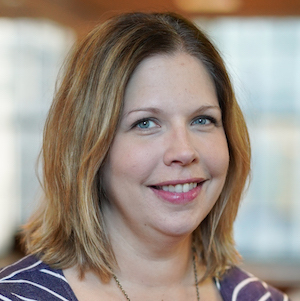 Find out in our new BMJ Insider’s interview with Jonna Peterson, MLIS, who served as a CI since 2015. “You can have $1M worth of resources, but if no one knows about them or how to use them…what you’ve got doesn’t matter,” Jonna explains. Please note: This is the first of our two-part series on the role of the clinical informationist; the “human ambassadors” of medical library resources. When did your career as a clinical informationist begin? I became one in 2015. I was very excited to join Galter because as the first informationist I was going to have an opportunity to design and sculpt my own program. Our program is unique in that it was requested by medical school administration. Often informationists have to make their own path and encounter significant resistance from the administration. I was fortunate because a member of the administration at the medical school requested an informationist be added to Galter’s staff. That level of support is key and trickles down into the faculty so much that we have a close relationship with the chief residents and program directors. They help make sure that we are integrating as much as we can into what the healthcare professionals do. I’m not sure anything can really prepare you for this work. I worked in a family practice clinic in college. Before I finished library school, I coordinated an immunology research laboratory with doctoral nursing students in an academic medical center. Essentially, I’ve worked in a clinic/hospital since the age of 20 and became familiar with the language and technology of medicine. The bulk of the role involves working with the faculty, students, staff in internal medicine (inpatient teams). I go on rounds with teams and help connect the team to resources; often I can make an impact in real time. They come up with the clinical questions and I connect them with the product that can best answer their questions. Consider us: Human Ambassadors for our library resources. You can have $1M worth of resources—or $1K worth of resources—but if no one knows about them or how to use them…what you’ve got doesn’t matter. Aside from tackling the clinical questions you receive daily, can you describe an area or a process where you feel you’ve made a difference/or impression? For the last 10 years, a local colleague and I have collaborated to provide a health sciences practicum experience for library school students nearing the completion of their degree. The students work with us in our libraries to compare and contrast the public service departments of both a public and private academic health sciences institution. I think we provide a valuable experience for those students and pique their interest in health sciences librarianship. Our other clinical informationist at Galter was actually one of my former practicum students! Can you provide an example of a clinical problem you have been asked to investigate? You must be gathering a lot of data. What should clinical information librarians be tracking? When the program began, I honestly guessed at what statistics to track. Over time, I’ve added to it. We keep the obvious information that all librarians keep: number of questions answered and who asked the question. We also keep the amount of time it took us to answer each question. This is particularly important because it shows us how much of our time each week is spent answering clinical questions vs. doing other work. We keep our data by FY, as opposed to CY, as that is how our statistics are requested from administration. For us, it’s also important to keep track of which teams and team members we’ve worked with. Our teams are constantly changing and rotating and it’s important for us to know who we’ve interacted with before and who is meeting us for the first time. Anytime you can make a personal connection with someone on a team, it helps! How can you gather impact evidence? What do you or would you use it for? We’re hoping that’s what the follow-up survey will start. Our patron group is not likely to show up in the Library to ask their questions in person and sometimes will not take the time to email them in. If Corinne or I are not present to hear the question, it often goes unanswered. Our impact could never be measured by the number of people who walk in the door. We all know that an informationist can add value to the clinical setting. But do you get involved with research teams as well? We work with plenty of research teams. It’s great when they consult us at the beginning of their project. We can help shape the project by determining what they need to know and guide them along if they are doing a project with a more formal structure, like a systematic review. Sometimes the team simply needs a survey of the existing literature. We can work on literature searches to inform grant applications, literature reviews and scoping reviews. We can also help them decide which publication type might work best for them and provide guidance on which databases to use. This is the million-dollar question. Ultimately, I’d love to be able to show working with an informationist decreases length of stay or saves the hospital money by assisting the medical teams in providing efficient care. I’m not sure the ideal path for this type of measurement has been defined. We have recently started to evaluate our service by follow up email survey. Up until now, our only feedback has been anecdotal. Our survey is a first attempt at gathering something more tangible/measurable and to provide an informed base for any changes we make to the program in the future. Do you have any advice to share with a library that wants to introduce the role of a clinical informationist on their team? I was fortunate in that my position was requested of our library by our medical school administration. I didn’t have to spend any time justifying my work or role as a part of a clinical team, to get my foot in the door. It is valuable to have a contact to whom your informationist can reach out for assistance with hospital system issues. Our chief residents and internal medicine residency program director are our greatest allies. Can you share one of the most important goals you have set for your team in the year ahead? Our most important goal is to complete our evaluation survey. We’re hoping for 100 responses, and last time I checked we’re 1/10th of the way there. With that data, I’d love to be able to expand our role to more days a week with the Department of Medicine. Way down the road, I’d love to find the justification to add another informationist to our team. What do you feel is the best part of your role? I like the challenge of trying to fit myself into a new team each week and then show how our work is relevant to a potentially skeptical group of people. The team itself is always changing with member rotating on and off; it’s a dynamic entity. I follow the clinical informationist listserv out of the UK, clinical librarian list from the Medical Library Association and try to attend relevant clinical informationist sessions at our annual MLA meeting. I’m also an invited participant at the McMaster University Evidence Based Clinical Practice Institute held each June in Ontario, Canada; I always find fresh new ideas with a spectacular group of colleagues North of the border. So many things! I enjoy spending time with my husband and our 15-month-old daughter. I enjoy cooking and baking. Previous to my daughter’s birth I had been a long-time volunteer at The Shedd Aquarium here in Chicago. I’m hoping to get back to that really soon!